Here in Istanbul we are surrounded by water: the Sea of Marmara, the beautiful Bosphorus and Golden Horn, and then the Black Sea. You would think that fish would be cheap – but it isn’t, and dinner in one of the many fish restaurants especially by the sea can be surprisingly pricey. All fish meals always start with any number of meze followed by the fish traditionally grilled, baked or fried and served with a salad. For me the meze are almost enough in themselves but I am always persuaded to have a fish afterwards. The most popular drink with fish especially in summer is rakı but a bottle of nice dry white wine is equally acceptable. 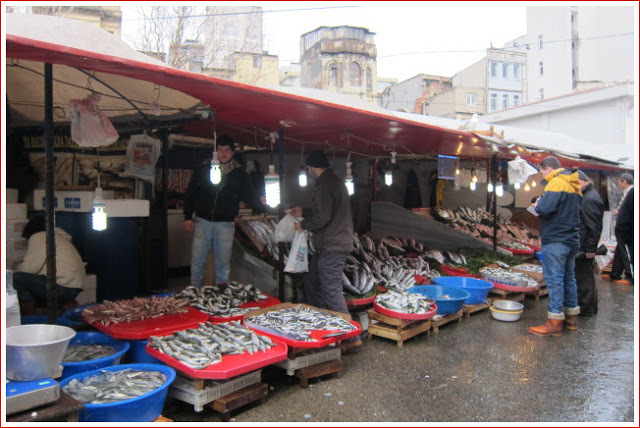 I love the traditional fish places like Karaköy and Kadıköy for their displays and atmosphere but in my experience the fish counters in the supermarkets do a better job of cleaning the fish especially if you want fillets. We were having friends round so I thought I would get some fillets of sea bass/deniz levreği, generally considered to be the queen of the fish, so I headed for my local Migros which has a great fish counter. I bought 3 beauties which were meticulously prepared and sliced into 6 fillets. This recipe adapted from Alev Kaman’s Modern Türk Mutfağı calls for a delicious sauce which I thought would make a change! Pre-heat the oven to 180C/360F. Wash and slice the mushrooms. Wash and de-seed the peppers, then slice. Trim the spring onions and slice thinly. Peel the tomatoes and chop. Wash and pat dry the fish fillets. Heat the olive oil in a pan, add the mushrooms and gently saute for 5-6 minutes. Add the peppers, spring onions, tomatoes, salt and pepper and cook for a further 5 minutes on a low heat. Put the flour in a mug and gradually add the cup of water, stirring all the time. Using a whisk, add the cream. 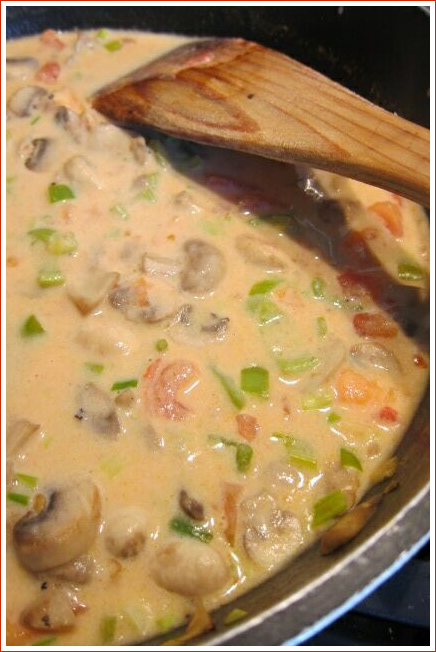 Add this mixture to the vegetables in the pan stirring all the time, and bring to the boil. 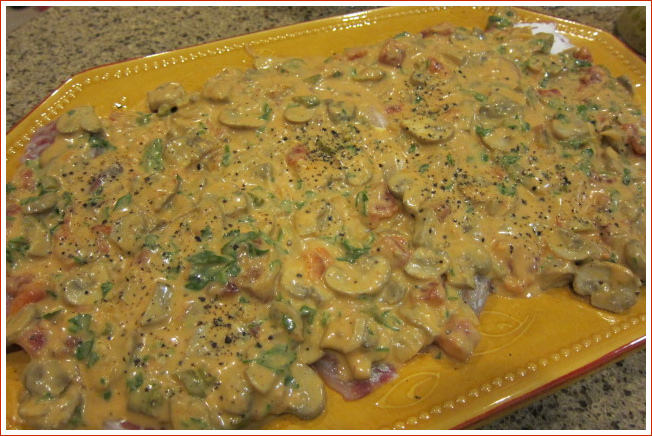 Place the fillets on an oven tray or suitable ovenproof dish and pour the sauce over. Bake for 30 minutes. Some potatoes and a green salad are all you need to go with this delicious fish dish. That looks fabulous….we get some lovely fish here in So Cal…I even have some halibut in my freezer…think I'll give it a go with that! This sounds like a recipe my OH would love (and so would I) will try it out real soon. Thank you! Great recipe idea! I often simply roast the levrek with a bit of EVOO, lemon and herbs, but this would make a nice change too. Thanks!